Ok, I'll admit I'm only 44% complete with this book, but this book is a master work of apologetic's for the Christian faith, and it actually proves God, and it proves it requires more faith to be an atheist than to be a Christian. It talks about how the creation of the universe points to God. It talks about the fine tuning of earth to support life points to God. It talks about how the DNA encoded in life (single cell organism has 1000 encyplopedias worth of intelligent messages in it) points to God. It talks about how Moral Law points to God. It talks about how Christianity makes the most sense as the "Box Top" to life, ie purpose of our lives here on Earth. If you ever need ammo against atheism this book has plenty of it, it will take you from pure FAITH to intellectually KNOWING God exists! Re: I don't have enough faith to be an atheist! It's an excellent book, as are most written by Geisler. It's written for a wider audience, doesn't go into great detail, but enough to make a lasting impression, certainly as one considers the evidences collectively. Last year, I taught a small community study group based upon this book. 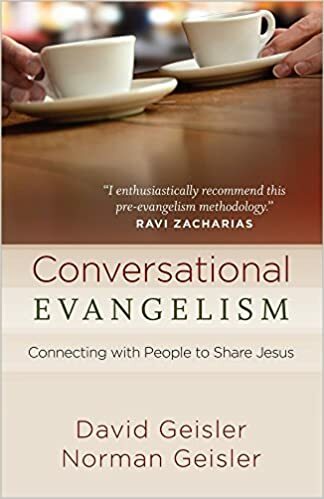 Also, as a very important companion book to ALL apologetic-type books, is Geisler and his son David's book, "Conversational Evangelism" - a book every Christian who cares about the Great Commission should own a copy of! Some atheists at school were mocking God and it got me mad. They act like degenerates too sometimes, um worse than me (uk that thread im referencing...though as I said I'm mild into it most is just awful). They talked about how God can't lift a rock and so Omniscience was phoney. God is the most powerful, yes. That doesn't mean He could logically do non logical things. claysmithr wrote: Ok, I'll admit I'm only 44% complete with this book, but this book is a master work of apologetic's for the Christian faith, and it actually proves God, and it proves it requires more faith to be an atheist than to be a Christian. The thing is though is atheists actually think they have refuted all of these arguments for God.This is why my tactic is to hammer them about the lack of proof muchless evidence atheism is true.Then I challenge them to put their evidence atheism is true up against evidence for the bible and God being real. They usually explain to my why atheists do not have to give any evidence,that atheists are excluded from needing any evidence. So then I say well I'm going to show you how to present evidence behind what you believe,not to try to convince atheists who obviously do not go by evidence but instead how they feel,but just to show I can and atheists can't.Then I present some evidence and challenge atheists to present evidence atheism is true and when they don't.I say well I'm not giving anymore evidence until atheists do. I have already given evidence and I'm not playing the atheist deny any and all arguments and evidence for God away game,while atheists sit there with no evidence. I don't think the book is aimed at atheists because if it had been, the title would be different. It is aimed at Christians mostly and what I think, "preaching to the choir". Most atheists don't identify with the title, some may but that is a bleak minority and even then they'd be hesitant to call it faith. I wanted to clarify that I appreciate the apologetics of the book anyway. I just think that title and the claim it makes, is a misrepresentation and reaffirms a notion that is mostly unrealistic. Effort wasted IMO. I made an atheist cry during a theological discussion once. I asked him if he ever loved anyone. He said yes. I said prove it. He said I can't. And teared up a little. I said well, then love doesn't exist. See? I surmised he'd lost someone he was close to. He didn't know what to say.. since you can't prove love exists in a laboratory. I was happy to get my point across. I used to get soused on Kalik beer in my dorm room have theological discussions and discuss God with him. He always liked to blast me with scientific facts. Lol. He was usually on the computer and always down for a good theological fencing match. Lol. I really liked him. He was a great guy. I hope he's okay. Neo: I wanted to clarify that I appreciate the apologetics of the book anyway. I just think that title and the claim it makes, is a misrepresentation and reaffirms a notion that is mostly unrealistic. Effort wasted IMO. The Geislers' book in no way is a misrepresentation, because from their view - from mine as well - it takes much more faith to believe that this universe and world could exist without the capabilities of a God than to believe it must be God-caused. And only a person who has not read the book would likely think this. But the title is also aimed at people who don't know a lot of detail behind what exists - as they dismiss the typical strawmen arguments while claiming no God is necessary. So, I don't have that kind of faith either.